Whenever you need tree removal or tree trimming in Colorado, place your trust in us. Advanced Tree Service LLC provides a multitude of Residential & Commercial tree related services to fit your needs as well as a variety of other services. We service a majority of the front range in Colorado. 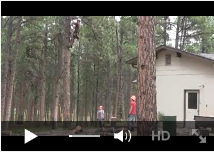 Advanced Tree Service LLC is a licensed company, based in Colorado Springs. We are a family owned company that is operated by an arborist with over 20 years experience in tree removal, tree trimming, stump removal, tree shaping and thinning, storm restoration and fire mitigation. Advanced Tree Service LLC is dedicated to conservation, and committed to excellence. We take the utmost pride in our work and strive to build a lasting and trustworthy relationship with our customers. We offer free estimates and senior citizen and military discounts, so give us a call today and let us provide all your tree removal and trimming needs.